The spirit of Frontside carving is alive and well in Head's i.Supershape ski line. If you're looking with disdain at fat-waisted All Mountain skis and wondering where your race-roots carvers are, take a look at Head's offerings. The i.Supershape Titan falls into exactly the same category as Dynastar's excellent Speed Course Ti. The ski is a lively, on-your-toes, race-bred beast, happily freed from the nonsensical FIS geometry rules that hobble today's true race stock. In other words, take a World Cup GS racing ski, modernize the sidecut and radius, and this is what you get. Narrow, traditionally-cambered skis like this, sad to say, do seem to be a vanishing breed these days, but they remain unchallenged when it comes to elite-level carving on hard snow. If you have no racing background yourself, probably you'll be much happier riding a friendlier plank like Nordica's Fire Arrow or Rossignol's Pursuit-series skis. But, if you want a ski that will take you right back to your racing days, these are a fine choice. The Supershape line has several gradients, including the very stiff i.Supershape Speed, with a tail that feels almost exactly like race stock. The Supershape Titan relaxes the Speed's feel a tad, but don't expect the ski to baby you: this remains a serious carving tool that demands high-level technique. Though I'm certainly no longer in my racing prime, I do find a pair of modernized race skis an essential part of my quiver. If I'm going to be skiing a resort with lots of wide-open, steep, high-speed groomers, these are the kinds of skis I want to be riding. For my taste, Dynastar's Course Ti gets the fun versus fear factor exactly right—better, I'd say, than the Titan or i.Speed. However, skiers wanting to get as close as possible to that traditional race stock feel should definitely try Head's Supershape models. In either Titan or Speed version, the Head skis are very close to the feel of a true race ski: stiff, damp, and relentlessly capable. 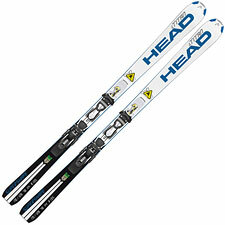 So give Head props for continuing to offer us race-bred recreational skis. True carving skis remain a formidable tool in the expert's arsenal, as Head's line so aptly demonstrates.